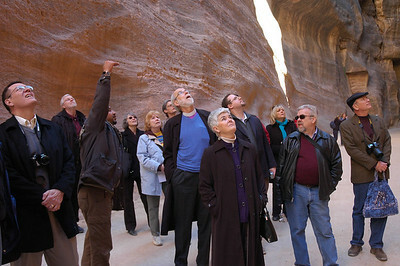 The ELCA group view outstanding scenery during a Jan. 4 tour at Petra, Jordan, a well-known historic archeological site. 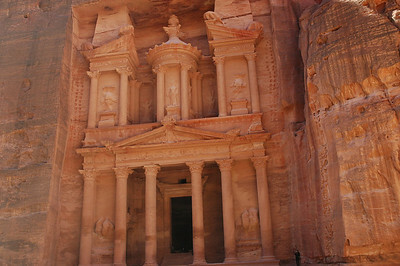 The ELCA visitors saw this famous tomb, carved out of solid rock, at the Petra site. 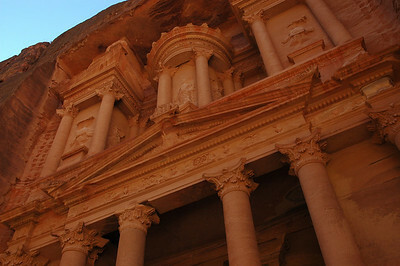 A close-up view of the most famous tomb at the Petra site. 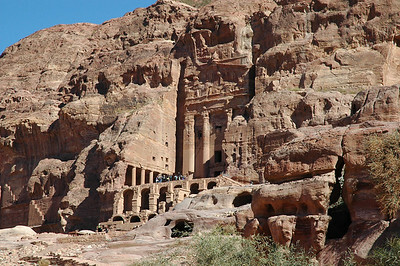 The Petra ruins include many large, impressive tombs, such as this one, carved from solid rock. 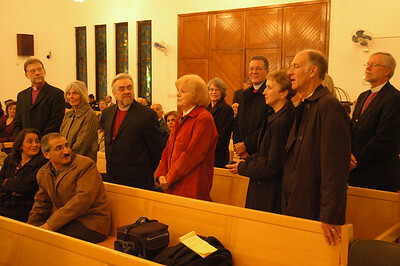 The ELCA bishops introduced themselves to the congregation Jan. 4 at Good Shepherd Evangelical Lutheran Church, Amman. 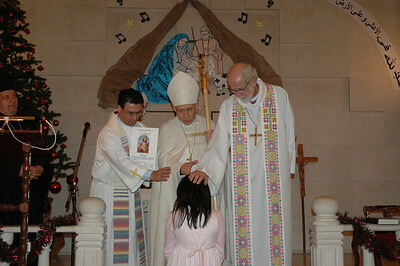 Confirming one of six confirmands Jan. 4 at Good Shepherd Lutheran Church, Amman, are the Rev. 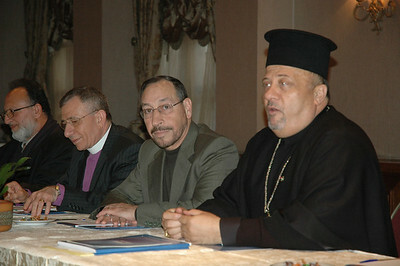 Samer Azar, pastor; ELCJHL Bishop Munib Younan and ELCA Presiding Bishop Mark Hanson. The Rev. 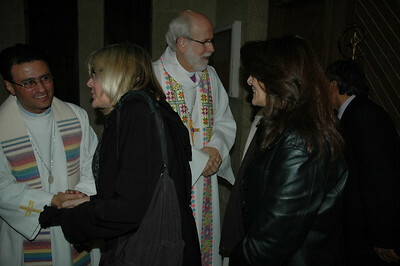 Samer Azar, left, pastor of Good Shepherd Evangelical Lutheran Church, Amman, and ELCA Presiding Bishop Mark Hanson, greet worshippers at the Amman congregation Jan. 4. The Rev. Gerald Mansholt, bishop, ELCA Central States Synod, greets Zeid Al Rafai, president of the Jordanian Senate Jan. 5 in Amman. ELCA Presiding Bishop Mark Hanson, center, accepts a gift from Zeid Al Rafai, president of the Jordanian Senate, in Amman Jan. 4. At left is Bishop Munib Younan of the ELCJHL. Father Nabil Haddad, Jordanian Intefaith Coexistence Research Center, right, addresses the ELCA bishops during a meeting in Amman Jan. 5. To Haddad's right is Jordan's Minister of Islamic Affairs, Abdal Fatah Salah, and ELCJHL Bishop Munib Younan. Bishop Bruce Burnside, ELCA South Central Synod of Wisconsin, Madison, addresses a question to participants in a forum Jan. 5 at the Jordanian Interfaith Coexistence Resarch Center in Amman. At left is Bishop Murray Finck, ELCA Pacifica Synod, Santa Ana, Calif.
Bishop Margaret Payne, ELCA New England Synod, signs a document calling for Christian-Muslim cooperation, dialogue and work for peace. 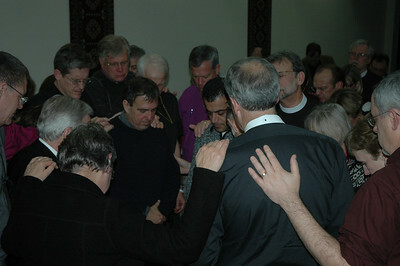 Several ELCA bishops signed the document in Amman, Jordan, Jan. 5. ELCJHL Bishop Munib Younan, left, makes a point during a meeting at the Jordanian Interfaith Coexistence Research Center in Amman Jan. 5. 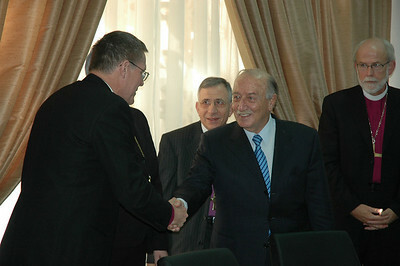 Next to Younan is Jordan's Minister of Islamic Affairs, Abdal Fatah Salah and Sami Gammoh, Vice president of the Center. At rear center is Bishop Bruce Burnside, ELCA South-Central Synod Wisconsin, Madison. 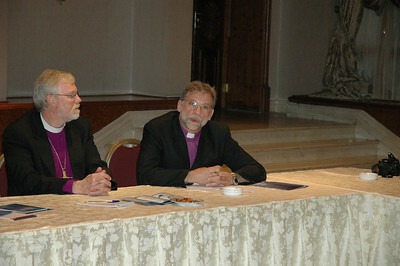 ELCA Presiding Bishop Mark Hanson addresses a news conference in Amman, Jordan Jan. 5. 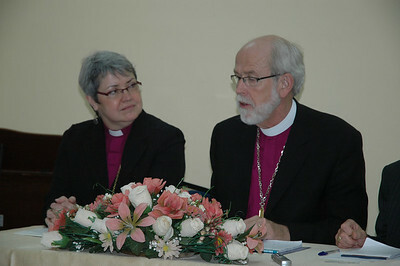 At left is ELCIC National Bishop Susan Johnson. 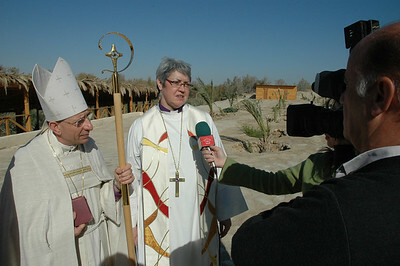 ELCIC National Bishop Susan Johnson speaks to Jordanian Television at the site of Jesus' Baptism in Jordan Jan. 6. 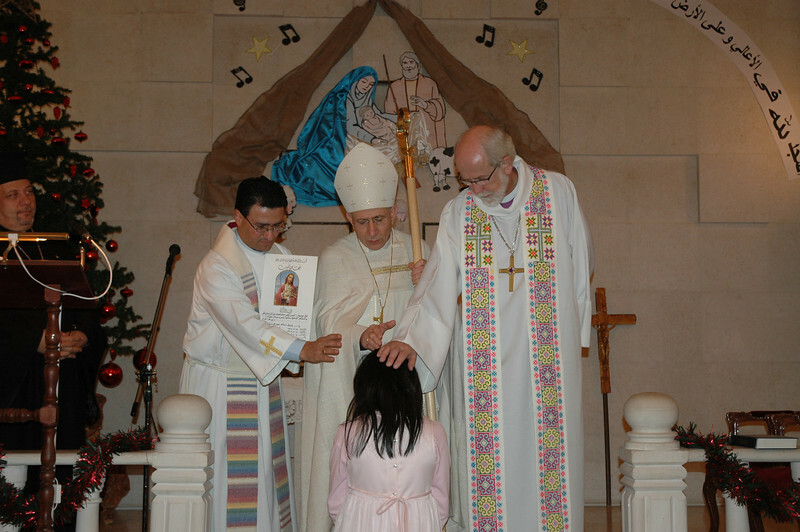 At her right is ELCJHL Bishop Munib Younan. 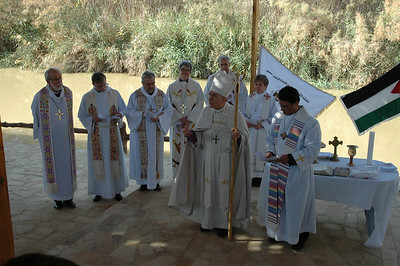 Clergy and bishops of the ELCA, ELCIC and ELCJHL led a worship service at Jesus' baptismal site in Jordan Jan. 6. 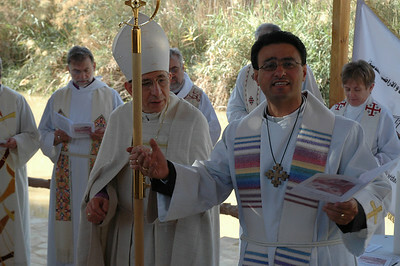 Pastor Samer Azar, right, Good Shepherd Evangelical Lutheran Church, Amman, Jordan, reads the liturgy at a worship service at the site of Jesus' baptism in Jordan Jan. 6. With him is ELCJHL Bishop Munib Younan. 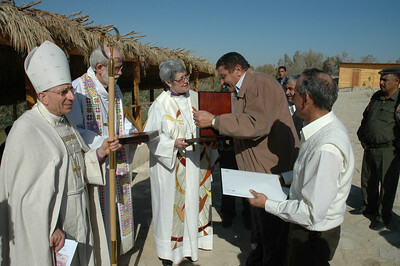 A representative of the Jordan Baptism Site Commission presents a gift to ELCIC National Bishop Susan Johnson. With Johnson, from left, are ELCJHL Bishop Munib Younan and ELCA Presiding Bishop Mark Hanson. His Majesty King Abdullah II of Jordan, right, addresses ELCA Presiding Bishop Mark Hanson during an audience with the Jordanian monarch Jan. 6 in Amman. ELCIC Bishop Susan Johnson and ELCJHL Bishop Munib Younan also attended. 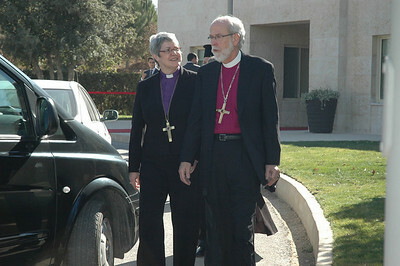 ELCIC National Bishop Susan Johnson and ELCA Presiding Bishop Mark Hanson leave the palace in Amman, Jordan, Jan. 6, following an audience with His Majesty King Abdullah II. 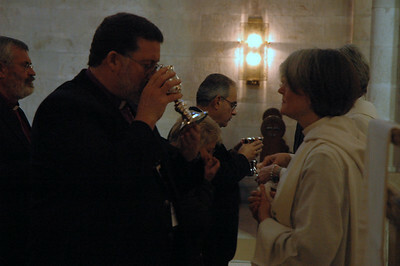 Bishop Michael Keys, ELCA Alaska Synod, takes communion Jan. 7 at a Conference of Bishops' worship service at the Lutheran Chuch of the Redeemer, Jerusalem. The Rev. Susan Briehl, serves the wine. 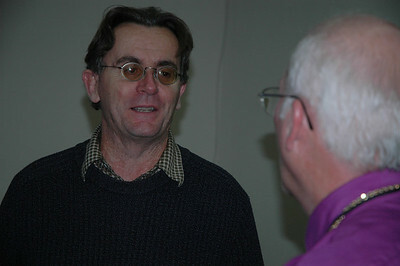 Ray Dolphin, UN Office for Coordination of Humanitarian Affairs, speaks with Bishop Gary Wollersheim, ELCA Northern Illinois Synod, following a presentation to the bishops Jan. 7. Mazen Faraj, left, a Palestinian refugee, and Rami Elhanan, an Israeli, discuss The Parent Circle, Israeli-Palestinian Bereaved Families for Peace, during a joint presentation to the bishops Jan. 7 in Jerusalem. Bishops and clergy from the United States and Canada pray for Rami Elhanan and Mazen Faraj following their presentation to the bishops Jan. 7. 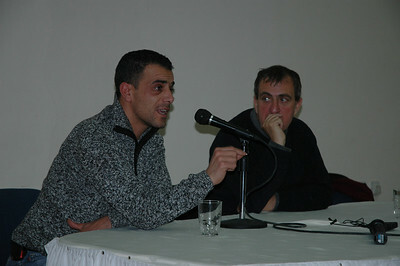 The two men are members of The Parents Circle, Israeli-Palestinian Bereaved Families for Peace. 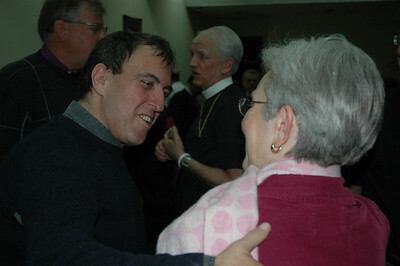 Rami Elhanan, left, whose daughter was killed in suicide bomb attack, speaks with the Rev. Susan Wilder, right, ELCA Washington Office staff for Middle East concerns. 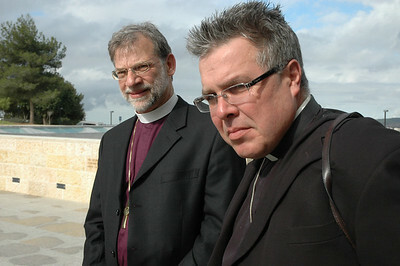 Bishop Bruce Burnside, left, ELCA South-Central Synod of Wisconsin and Bishop Michael Pryse, ELCIC, prepare to enter Yad Vashem, Jerusalem, a Holocaust memorial. 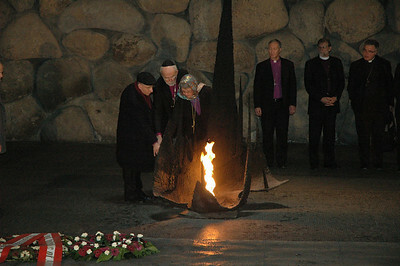 From left, ELCJHL Bishop Munib A. Younan, ELCA Presiding Bishop Mark Hanson and ELCIC National Bishop Susan Johnson light a symbolic eternal flame Jan. 8 at Yad Vashem, Jerusalem, a Holocaust memorial. 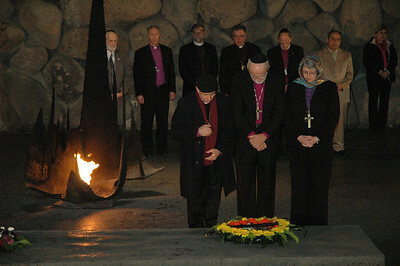 From left, ELCJHL Bishop Munib Younan, ELCA Presiding Bishop Mark Hanson and ELCIC National Bishop Susan Johnson lay a wreath Jan. 8 at Yad Vashem, Jerusalem, a Holocaust memorial.